Hi there! Today’s post is about Garnier Pure Active Anti-Imperfection Cleansing Gel which is aimed at people with oily skin that’s prone to imperfections. This product contains salicylic acid and zinc, and it promises to get rid of impurities and to tighten pores. You’re supposed to use this face wash like any other face wash. Apply it to wet skin, and massage it all over your face. Rinse. Done. In the past I’ve received treatment for angioedema and similar (seemingly random) allergic reactions on a number of occasions. So I’m always very cautious with new products, especially with products that have a cooling or warming effect, and anything that tingles. But back to the product! Whilst the first use was a scary experience, everything turned out fine. I rinsed the face wash off of my face, and things went back to normal. I also didn’t experience any redness, dryness or any other unpleasant reaction. I did, however, notice that this face wash really helps to keep my skin perfectly clean and clear! Garnier Pure Active Anti-Imperfection Cleansing Gel is available as 200ml for £4.99. I spent £5 in total for this product and the matching scrub (2 for £5 offer). Hi there! 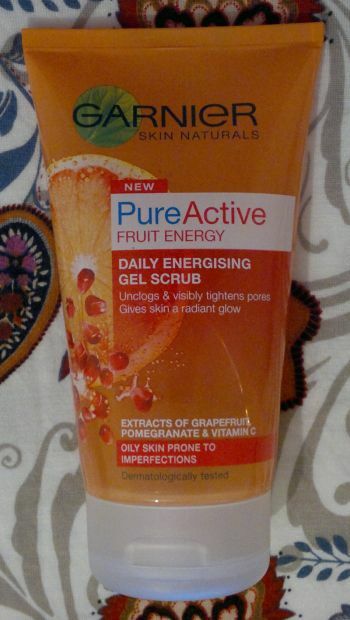 Today’s post is about Garnier Pure Active Fruit Energy Daily Energising Gel Scrub. This product contains salicylic acid, vitamin C, grapefruit and pomegranate extracts, and it’s aimed at people with oily / problem skin. It promises to unclog and tighten pores and to give skin a radiant glow. You’re supposed to use the product as a daily face wash. Since I use a konjac or cellulose sponge (+ face wash) to cleanse my face in the shower every morning, I used this product the same way – and I was impressed! This gel scrub is wonderful. It lathers up very well (it’s like it was designed to be used with a konjac sponge), it feels powerful but not harsh, and it really seems to “sweep up” grease and grime to give my pores a deep cleanse. I also think that this gel scrub has skin brightening properties. Every time I use this gel scrub, my skin tone looks incredibly even and, yes, radiant. It’s awesome! Since I have dry and moody skin, I can’t use this gel scrub every day. At the moment I’m using it once or twice a week which seems to work out perfectly. Garnier Pure Active Fruit Energy Daily Energising Gel Scrub is available as 150ml for £4.99. I paid £3.33 (special offer). Hi there! Today’s product is about Olay’s Hydration & Cleansing 2 In 1 Cleanser & Moisturiser Duo with aloe vera and cucumber extracts. This product promises effective cleansing by removing make-up and impurities. In addition, it claims to hydrate the skin. How does it work? You can use the cleanser with a cotton wool pad, or you can massage it into your skin and then “polish it off” with a damp muslin cloth. Apparently you can also use it as a moisturiser (it says so on the back). So how’s the product? I like it. It dissolves and removes my make-up with ease. Whilst I’m not using this product as a moisturiser, I can feel that it’s hydrating, and I believe it has helped me stay on top of my dry patches this winter. In summary, I think this cleanser is really nice. I would recommend it to everyone with normal to dry and / or sensitive skin. Olay’s Hydration & Cleansing 2 In 1 Cleanser & Moisturiser Duo is exclusive to Superdrug. The 200ml bottle is £2.99. I paid £1.48 (better than half price offer). Hi there! Today’s post is about 3 dirt cheap Boots own-brand products – Boots Essentials Cucumber Facial Scrub, Facial Toner, and 3-Minute Clay Mask. These products are £1.50 each, but Boots ran a 3 for £3 promotion, so I paid £1 each. Now let me tell you if these products are any good! I really like Boots Essentials Cucumber Facial Scrub because it’s effective without being too harsh. And the fragrance – which I’d describe as a clean and feminine fragrance with a hint of cucumber – is nice and pleasant. If I hadn’t known that this is Boots’ cheapest and most basic own-brand scrub, I wouldn’t have believed it. Well done, Boots! 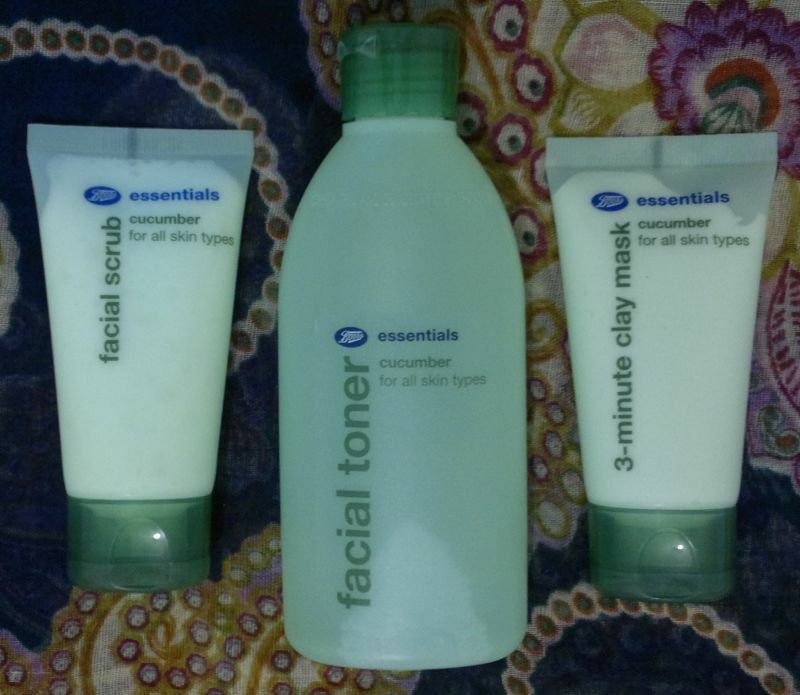 Boots Essentials Cucumber Facial Toner is very good. It feels refreshing, and the cucumber fragrance is really nice. And whilst this toner contains alcohol, it doesn’t feel drying at all. I’m also glad to be able to report that I found this toner perfectly safe to use around my eyes. There was no stinging or burning at all! Outstanding! Product number 3 is Boots Essentials Cucumber 3-Minute Clay Mask which promises to leave skin deeply cleansed, soothed and toned. Does it work? Oh yes! After a single use of this mask my skin felt cleaner and my pores looked considerably smaller. Yes, I left the mask on for longer than 3 minutes, but I always leave masks on for longer than recommended. In any event, the important thing is that my pores looked smaller. Considerably smaller! Awesome! Like I said, these Boots Essentials products are £1.50 each. The scrub and the clay mask come in 50ml tubes, and the toner bottle houses 150ml of product. I will continue to use these products, and I will buy them again, no doubt. I will also try other products from Boots’ Essentials collection. Have you tried any of these products? If so, how do / did you like them? Feel free to get in touch via the comments. And thanks for reading! Hi there! 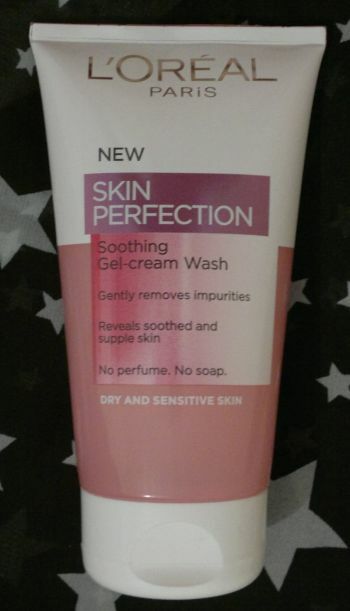 today’s post is about L’Oréal’s Skin Perfection Gel-Cream Wash for dry and sensitive skin. This fragrance-free and soap-free face wash promises to remove make-up and impurities, to reveal a better skin texture, and to make skin feel silky-soft. I’ve been using this face wash for 2 weeks now, and I’m very happy with it. I think this face wash is definitely gentle and non-drying. And when used with a sponge or a wash cloth (or similar), it’s a fantastic facial cleanser. Whilst I agree that this face wash leaves my skin feeling soft, I haven’t noticed any improvement in my skin texture. However, this is still a great face wash, and I would recommend it! It appears that L’Oréal is replacing its entire Skin Perfection collection. So if you want to try this face wash, or stock up before it’s sold out, you need to be quick! My local B&M Bargains store sells this face wash. It’s £1.99 for a 150ml tube which is great value! B&M also sells other Skin Perfection products (toner, cleansing milk, serum, day and night creams…), so you might want to swing by your local B&M too! OK, let’s start. I was quite pleased to find that these wipes are really big, so one was definitely enough to remove my make-up. At first I was hesitant to use these wipes near my eyes, but then I just gave it a go and took my eyeshadow off – which worked out fine by the way. I won’t let these wipes getting any closer to my eyes though! I was very pleased with how well these wipes removed my make-up. However, they left my skin feeling sticky and after a few minutes I could feel a tingling sensation on my face. So instead of taking chances, I washed my face (with my favourite face wash) to remove whatever residue these wipes left behind. Now that I’ve used these wipes, I can say for sure that I won’t be buying them again. 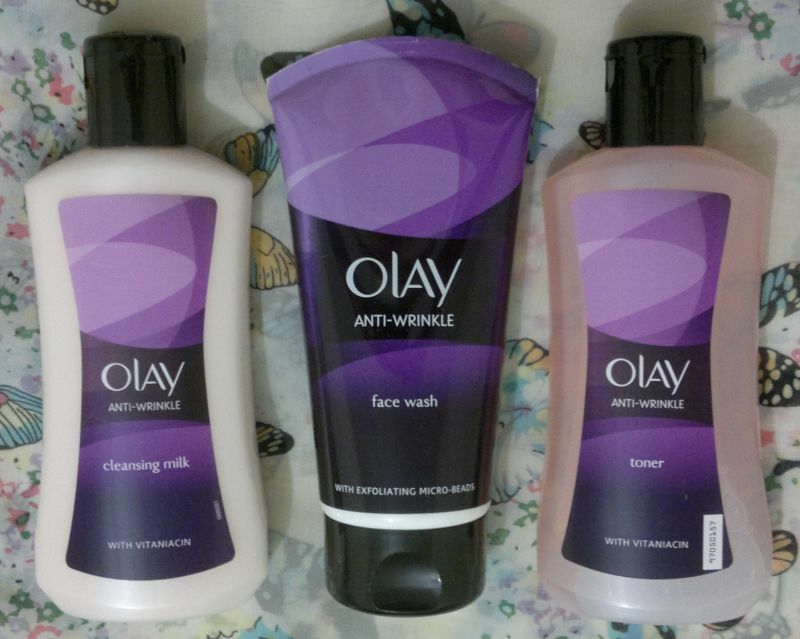 I’ll use up the ones I’ve got to remove heavy make-up, but since I have to wash my face after using them anyway, they’re not saving me time or money, so I’ll stick to my face wash (or cream cleanser) plus toner routine. If you’d like to try B. 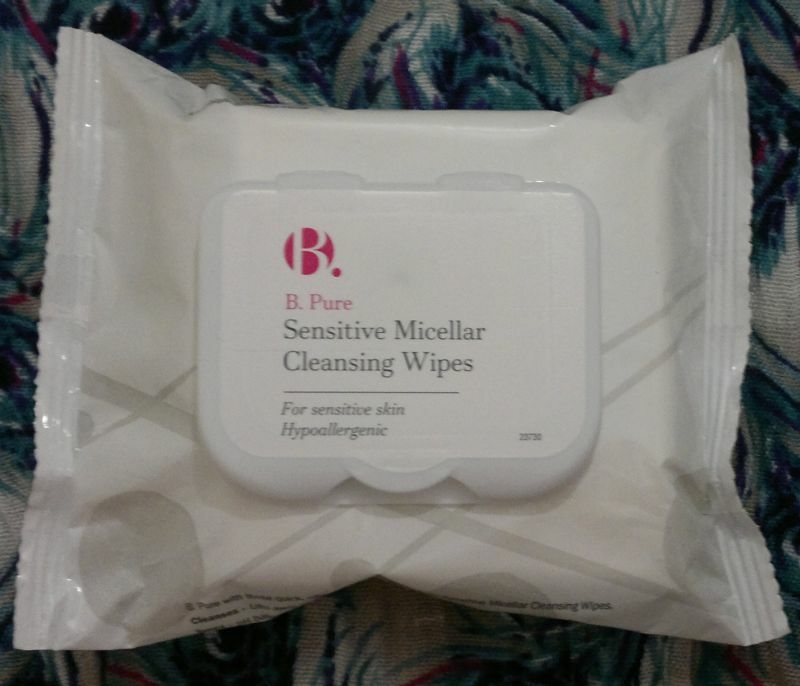 Pure Sensitive Micellar Cleansing Wipes, they’re £3.99 at Superdrug’s, but they’re currently free if you spend £10 on skin care!